So my lovely husband Stephen bought this for me as a late birthday present. 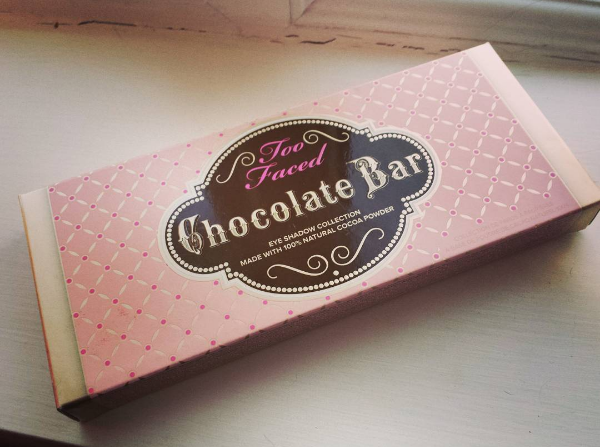 I've been thinking of trying something from too faced for ages but when your like me spending that kind of money on something when you don't know what its like is a little scary. l know there are people who can spend more than that but I'm a poor person haha but I took the plunge and put it on my list for my husband. It arrived in the post a few days ago and l was so excited when I saw the courier man arriving with a little parcel for me .. So on to my first impressions.. 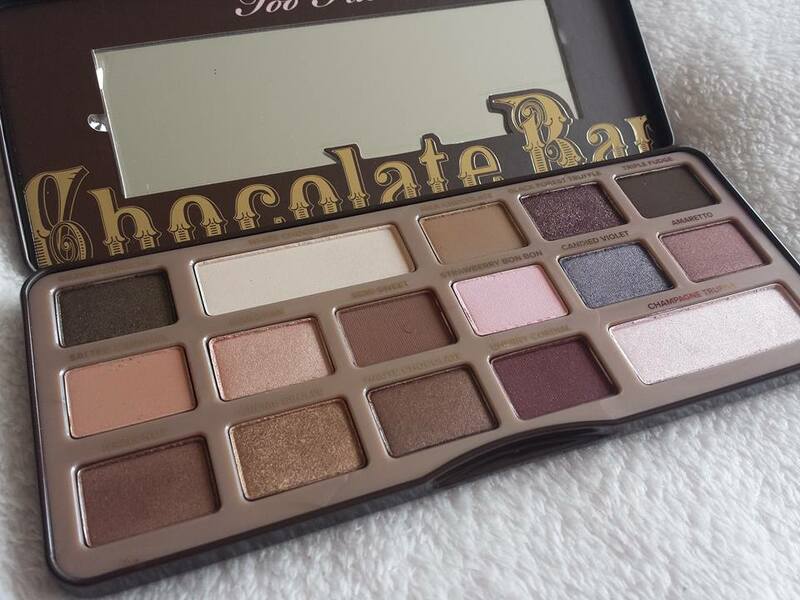 So lt comes in that lovely box above and l love it , lt kind of looks like a chocolate bar wrapper. At the back it has all of the ingredients of the eye shadows and lt also shows all the names of it as shown in this picture. I think it looks so cute and girly. On to the actual palette it's brown like a chocolate bar and has raised letters. lt also has a tin like feel to it and has a magnatic closure to keep it closed which is great makes it more secure. I've heard recently that the older packaging was much thicker than this so l'm glad l got the new one which is more slimline , the same as the semi sweet. 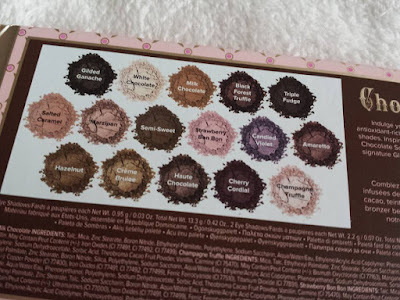 As you open the palette you will have 16 shades with their names under each one , l know the older version of the palette had a plastic insert with the names on it so l'm glad they actually printed the names under each one on to the palette makes life so much easier. 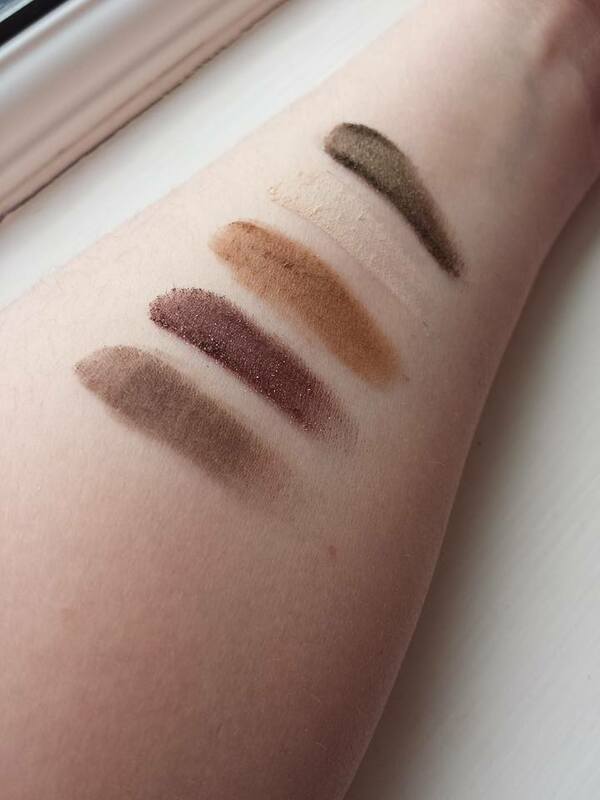 So these shades range from mattes, shimmer glitters and you also have two highlighters . 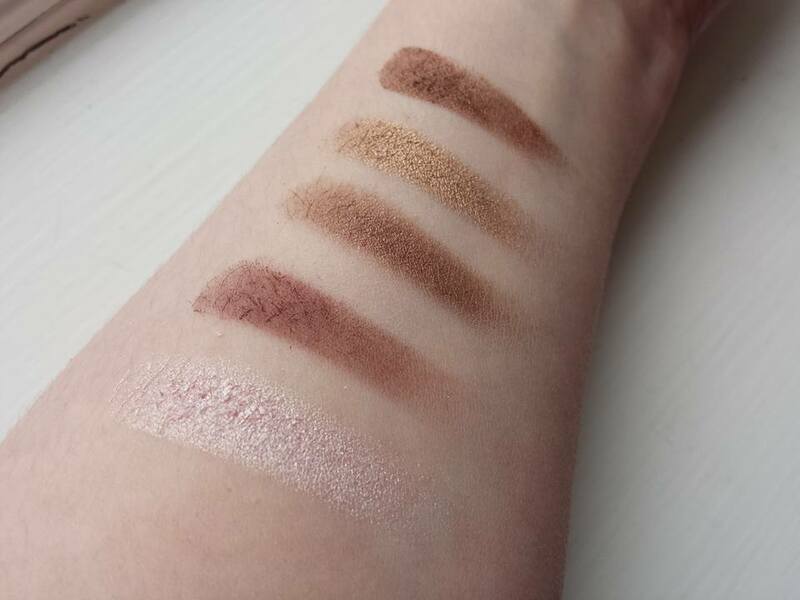 I've only tried these a few times but my first impressions of these are that they are very extremly pigmented so be careful when you are applying them. 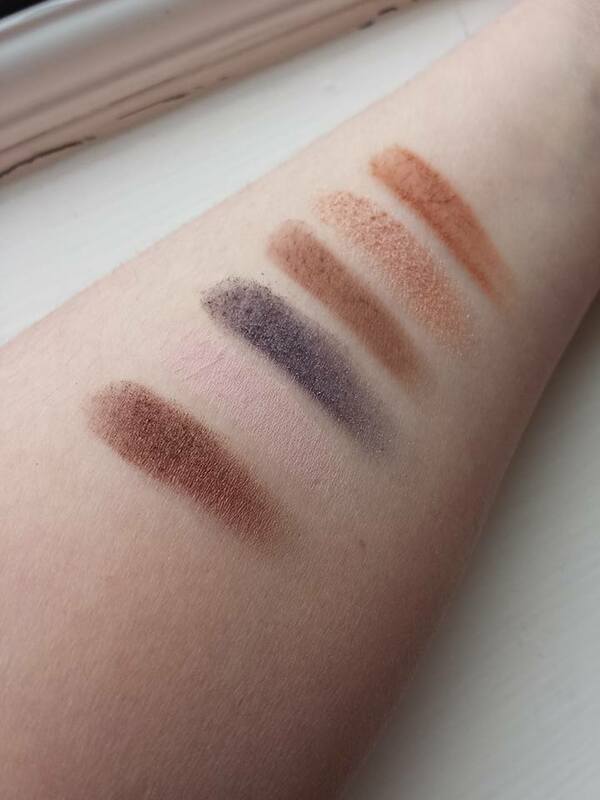 What surprised me that there was no fall out for the amount of pigmentation you get. Another plus so far with this palette is that they are so easy to blend , great for the base and transitions in the crease. The highlighter l've used so far is champagne truffle , lts so nice . its a pinkish highlighter with a gold sheen. I can't wait to try this for valentine's day. I would describe this palette as a very warm toned palette especially with all the browns and golds. 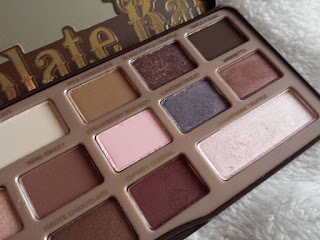 So lf you like warm toned palettes this one might be for you. So what are my first impressions ... l loved the box more than the outside of the palette , l understand that they were trying to make it look like a chocolate bar but l wish they did it in a different colour like even white would be nice , brown makes it look dull and boring.I think the smell of this palette really smells like chocolate and l love chocolate. 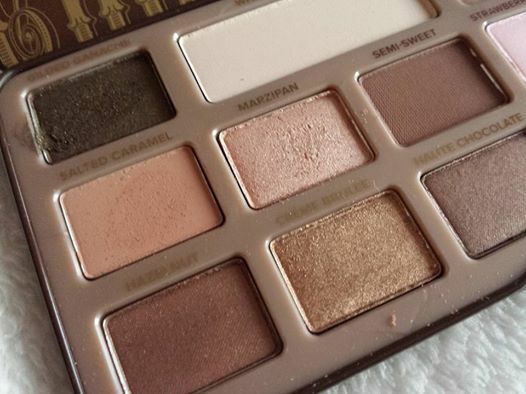 The shades in this palette are my type of shades, l'm pale so l like shades that warm up my face . These eyeshadows are very pigmented , easy to blend , no fall out which l'm so glad about because l hate when l got the Gwen Stefani from Urban Decay there was a good bit of fall out from some of their shades and it really annoyed me. 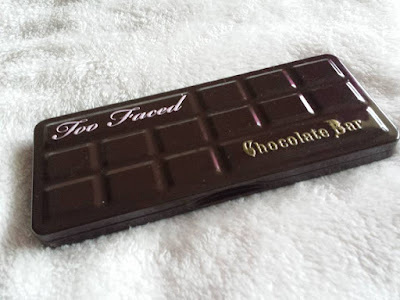 So far l'm loving too faced a lot more than Urban Decay so let me ask you do you think Too Faced is better than Urban Decay and is Urban Decay Overrated ?